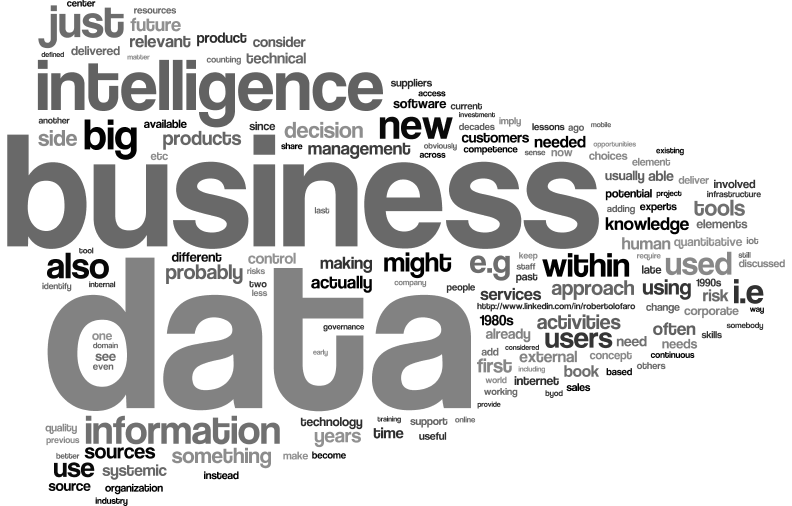 Business Intelligence in the era of Big Data: how do you identify which data are relevant? This short book is a discussion based on my over 25 years of experience of promoting the use of data (and tools) for decision support, first with DSS/EIS and management reporting, then with data warehousing, business intelligence, CRM, and web-based technologies. This short book (or extended essay) is just part of a series of collected thoughts and analysis. Focus: the impact of social and technological change on traditional management practices. Aim: to raise informed questions, not to provide answers. This series has just a common thread: repeating that “connect experience and knowledge to initiate change” approach, but focusing each time on a specific issue.